SCUBA was the next day. SCUBA lessons in near-freezing water with visibility so poor I could barely see my own hand. 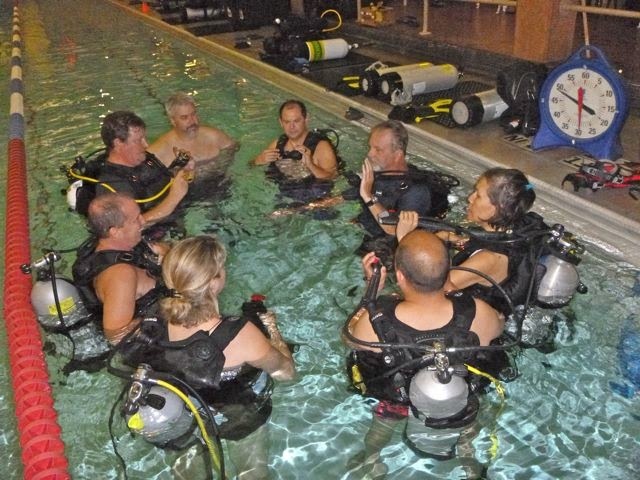 Tacoma Washington in February is not the most ideal place to get SCUBA certified. 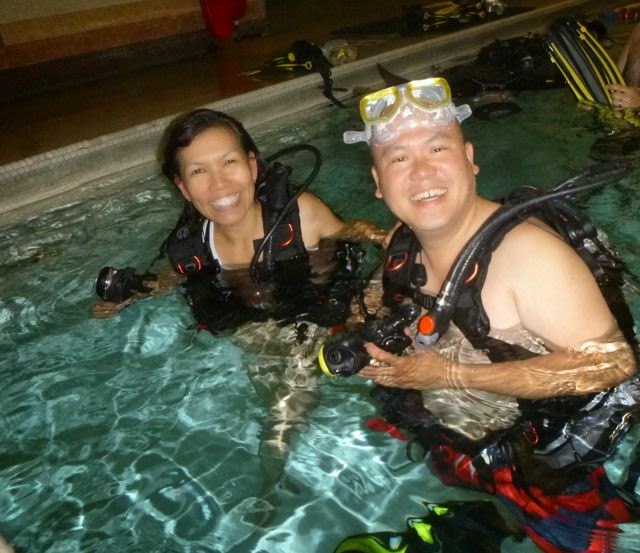 The payback for my SCUBA lessons was diving in Hawaii for our honeymoon with my SCUBA certified husband. Holding hands with Wayne, swimming together underwater in the warm, clear Pacific among the near shore reefs was unforgettably sweet. Then several years went by without any SCUBA diving. Even our last two years in the Caribbean, our below water experiences were all free diving or snorkeling or using our hooka (not all hookas are for breathing tobacco). Wayne prepares to descend with the "aid"
Our hooka was scary. We inherited it with the boat. 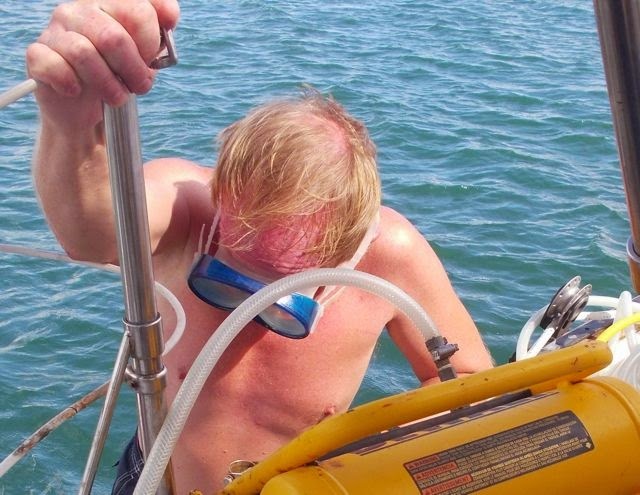 While we admire the thrifty cleverness of hooking an air compressor to a hose to get hull work done without free diving, using it freaked me out. It required running our Honda Generator to power it, but the generator's sound was handily drowned out by the jackhammer-like noise of the compressor. Breathing with the compressor was not smooth and easy; it was more like gasping for air and not quite getting satisfied. It didn't help that my first stints with it were unsuccessful attempts to discover something (find a dropped item, check out what was causing vibration on our propeller shaft) in silty water. the regulator to breathe underwater. As we prepare to set sail for two years sailing the South Pacific, from Florida to Australia, we decided the time has come to ditch the compressor and get at least one SCUBA tank and the requisite gear to use it. As we venture out into deeper anchorages and more isolated areas, becoming more self-sufficient is paramount. That likely includes more underwater boat work. The folks at West Marine Jacksonville Florida Town Center welcomed me back to work. Lo and behold, since last year the store added a dive shop! Great gear, good prices made even better with my West Marine employee discount (shameless plug -- West Marine Dive students get a 25% discount on their Mares dive gear). Better still, our store got tapped to pilot selling SCUBA lessons in conjunction with Guardian SCUBA, who offers SSI certification (SSI covers the same skills at its better known counterpart, PADI). The pool work portion for the classes are held in a pool a block and a half from our apartment, just a few weeks before we move back onto our boat. I couldn't resist showing up for West Marine and Guardian's first lessons -- a free orientation and dip in the pool, fully geared up! It was amazing just how much nicer the Mares gear was than when I took lessons back in 2007. Everything was so easy to get into and out of, fit comfortably and the weight pouches were much easier to use than the unwieldy weight belts from the days of yore. Plus, the enthusiasm of the Guardian folks is infectious; it's impossible not to get excited, and their unflappable attitude quickly resolves any learning hiccups. but a congrats on our completing them prior. 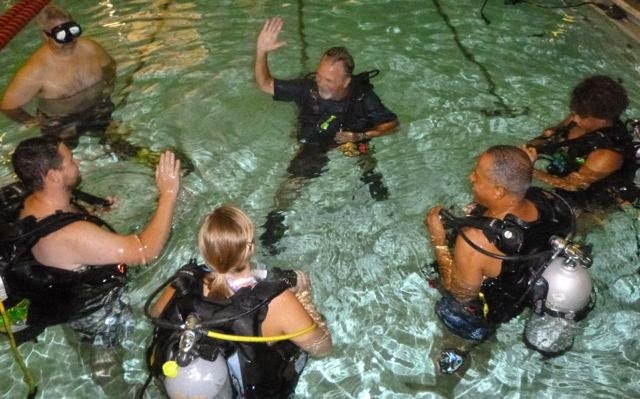 are busy getting used to their SCUBA gear. "Was it cool?" Cris, the instructor asked (Cris shot and provided the video clip - Thanks, Cris!). Yes, I agreed, though itching to take this awesome experience out beyond the confines of the pool, and into a tropical wonderland teeming with life... I can hardly wait to swim with the fishes again, this time, deeper and longer than my snorkel alone allows. Even if our SCUBA is mostly for anchor management, changing zincs and to keeping our boat hull free of barnacles and other unsavory attachments, it will feel good to do it with confidence in myself and in our equipment. Best of all, anytime I get into dive gear, I'm reminded of my Hawaiian wedding and honeymoon. planned trip to the Philippines. Just a few more weeks in our Jacksonville, FL apartment. This week our boat moves from Green Cove Springs Marina storage into the work yard, to have its mast pulled and re-rigged, a new bottom job, buffing and whole host of other maintenance tasks. We're set to splash November 18th, and head towards the Panama Canal sometime this December. This morning in Jacksonville is clear at the moment, but 44 degrees F right now. Looking forward to heading South soon! Ken we bought part of one set of dive gear -- mostly a regulator. We need at least another regulator or BCD with regulator and at least one tank. We both have fins, mask (though I'd love to upgrade mine) wetsuits and at least 1 weight belt. Still shopping! We have the rest of this month to close on our final purchase. Nice of you to offer, Ken! Emailed you with our phone to chat first about what you have. Thanks!